Cloudworks was launched some 15 months ago now, and we are starting to see some distinctive patterns of activity on the site. We believe that this open space, which facilitates discussion between different communities of interest or practice, has the capacity to promote dynamic, evolving and potentially transformative networks. Our position is that ‘community’ on the site is likely to evolve through many forms and that it can be seen as a process or lifecycle, rather than an absolute state. We are also able to begin to make some fairly clear recommendations about how best to go about facilitating community activity and discussion in this rather unique space. The following framework has come out of our observations about what seems to work and what doesn't on the site, and is well supported by the literature. We hope to empirically validate this framework over the next year or so and would value your thoughts and feedback. This may be controversial: exploring dissonance. Is this the mode of behavious expected for the whole of cloudworks? For all online communities? Or a smaller subset of either? We are increasingly seeing Cloudworks as part of a network of platforms a community will use at different times and for different activities. My current favourite model for explaining this in relation to Cloudworks vs other platforms or face to face meetings, is Linda Gratton's 'Effects of relationship quality on value creation' model (Hot Spots, 2007). Which seeks to show the impact of closed/ open group interaction and depth of relationship on activity type (I'll add it above). 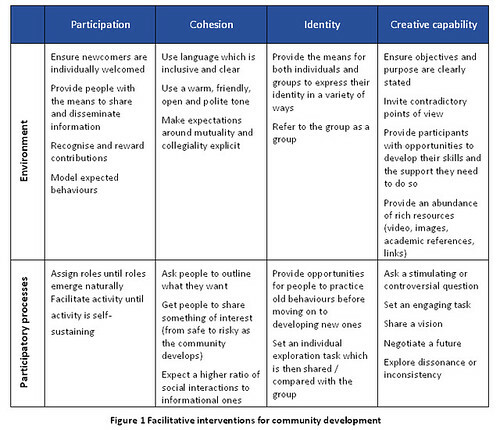 I think the model explains well what tends to happen to collaborative activity when participants engage across boundaries, and with people who are different rather than similar in outlook, in comparison with what happens in closed networks and communities. The kinds of community activity that seem to work well in the site are those which benefit from this transience and cross-CoP dialogue (ie flash debates, open reviews, crowdsourcing etc), and where the risks (i.e. relating to trust, misunderstanding of norms, expectations and language etc) are managed - hence the guidance above. Of course when we work in a commmunity we will be flipping between seeking inspiration, information gathering, sharing, debate, reflection and integration, and will therefore need different types of platform at different times, so we need a set of different types of spaces and tools to move the information and discussions around. We think that Cloudworks is a strong and unique addition to a set of spaces an educational community might use, and are working to integrate the site better with other platforms to facilitate these shifts across networks: i.e. a wider range of embeds, use of Google gadgets, multi-party direct messaging etc. What we hope is that Cloudworks will by default become the 'hub' and archive for community activity, creating flexible links between closed/ open spaces, blogs, repositories. So to answer your question these aren't at all a set of cultural rules - whatever works is fine - but instead they just suggest ways in which community activity might be supported on the site.